Plants up to 5 (-10) mm in length, with few erect axes although some secondary formation from recurving basal ramuli is possible. Main axis up to 100 µm in diameter, the cells about as long as broad, ecorticate although some cells lower down may form short rhizoidal filaments. Main axis clear, but ultimate branch systems subdichotomous, the apices blunt and ca. 15 µm in diameter; apices of the axes overtopped by crowded incurved laterals. Laterals branched from the basal cell, roughly issued at 90º between consecutive segments. Tetrasporangia sessile, usually one or two sporangia of different ages on one cell, at maturity measuring ca. 60-65 X 50-55 µm, tetrahedrally divided. Sexual plants dioecious. Spermatangial heads very small, up to two - four per cell in a row on the adaxial face of the ultimate and penultimate branchlets. 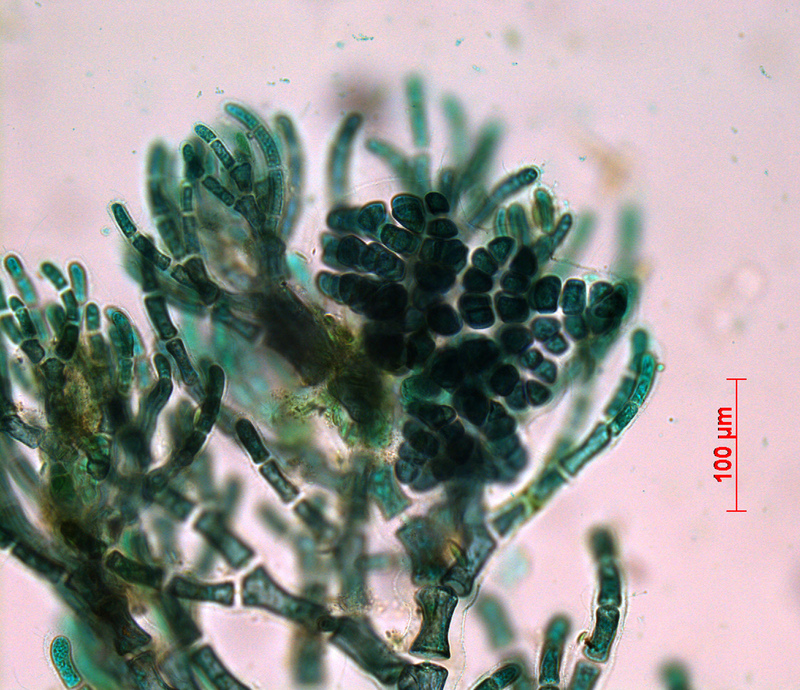 Carposporophytes often quite deeply lobed, carpospores when ripe ca 25 µm in diameter. Recorded from Cape Hangklip to the Three Sisters area near Port Alfred (19-39). 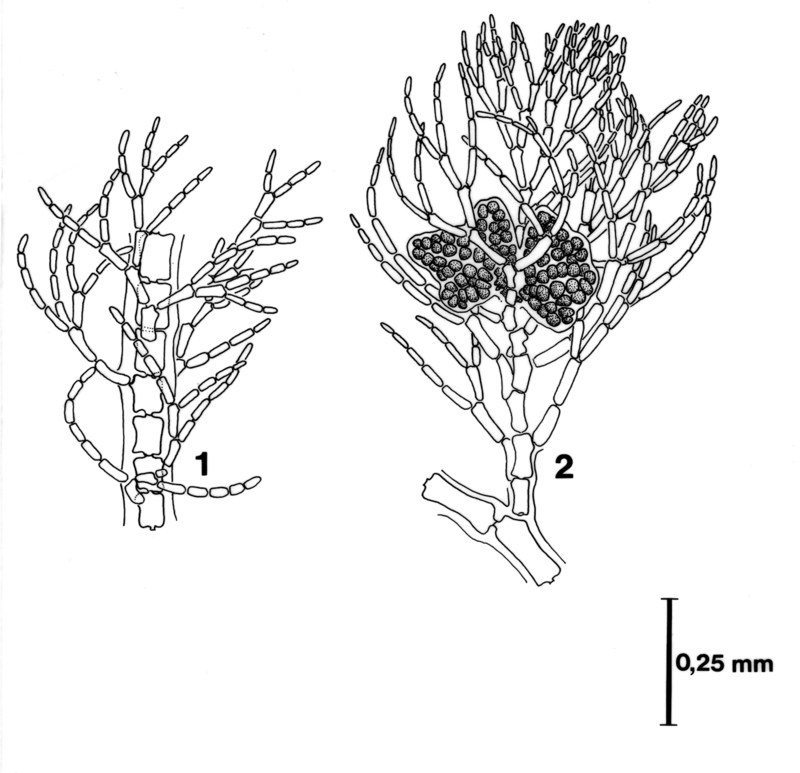 Generally epiphytic on larger algae,e.g. Amphiroa ephedraea. World distribution: Apparently widespread in warm temperate and tropical localities (various references cited in Guiry & Guiry 2015). Type locality: Between St. John and St. Thomas, Virgin Islands (Silva et al. 1996). Note: As the species is described from the tropics, there may be reason to doubt the identity of our species..
Callithamnion cordatum, showing carposporangia. Stained slide, subtidal material, Tsitsikamma. Callithamnion cordatum 1. Main axis in proximal region. 2. Thallus apex with carposporophyte. Reproduced from Stegenga et al. (1997). Børgesen, F. 1909. Some new or little known algae West Indian Florideae. Botanisk Tidsskrift 30: 1-19, 11 figs, Plates I, II. Guiry, M.D. & Guiry, G.M. 2015. AlgaeBase. World-wide electronic publication, National University of Ireland, Galway. http://www.algaebase.org; searched on 13 November 2015.